It’s officially summer, and the kids are out of school. This means parents are looking for new, fun, and exciting things to do as a family. The Dallas/Fort Worth area has abundant activities that are family-friendly, and many of them are wallet-friendly as well. There are outdoor activities such as parks, water activities, and sports games as well as indoor options for the days it’s just too hot to be outside. Here are some of our favorites, in no particular order! 1. Visit White Rock Lake: Located in northeast Dallas, White Rock Lake is a reservoir that’s surrounded by lush landscape. Locals and visitors alike enjoy kayaking and canoeing, playing with Fido at the dog park, exploring the hike and bike trails, or visiting the nearby Bath House Cultural Center. It’s the perfect place to get out and enjoy a beautiful day with the family, get a little exercise, and take a break from the concrete jungle! 2. Visit the Dallas Zoo: Right now there are more than 25 animatronic dinosaurs on display at the “Giants of the Jurassic” exhibition, which runs through September 7th. Kiddos can hear them roar and observe them in all their glory before viewing the rest of the zoo. Another great exhibit on display this summer is the Giants of the Savanna habitat, where visitors can feed giraffes, view elephants, and watch a bird show. The Dallas Zoo is the oldest and largest zoological park in Texas, spanning over 106 acres just three miles south of Downtown Dallas. 3. Attend a Rangers Game. It’s baseball season, and the Texas Rangers are playing several times throughout the summer on their home turf. While it can be pretty hot during summer’s peak, it’s exciting to take part in one of America’s favorite past times. You can check their schedule on ESPN.com as well as purchase tickets and see who’s pitching! 4. Explore the Perot Museum of Science and Nature. Located just southeast of downtown Dallas, the Museum is a great place to spend the day learning with your family. For $19 (adults) or $12 (kiddos), you have access to hours of fun and tons of permanent exhibits. The building itself is a work of art, and exhibits include a Children’s Museum, Being Human Hall, Texas Instruments Engineering and Innovation Hall, Lyda Hill Gems and Minerals Hall, Expanding Universe Hall, and many more exciting activities. 5. Play at a Splash parks! There are several splash parks around the DFW Metroplex including Celebration Park in Allen, Campbell Green in North Dallas, The Village at Fairview and Sycamore Spray Ground in Fort Worth. DFW Child.com has a great list of free splash parks, complete with hours of operation and details. Basically, a playground with water, splash parks are becoming more and more popular as a free, fun way to beat the Texas heat. 6. Visit Hawaiian Falls. A step up from your average splash park, Hawaiian Falls opened its first Water and Adventure Park in Garland in 2003. 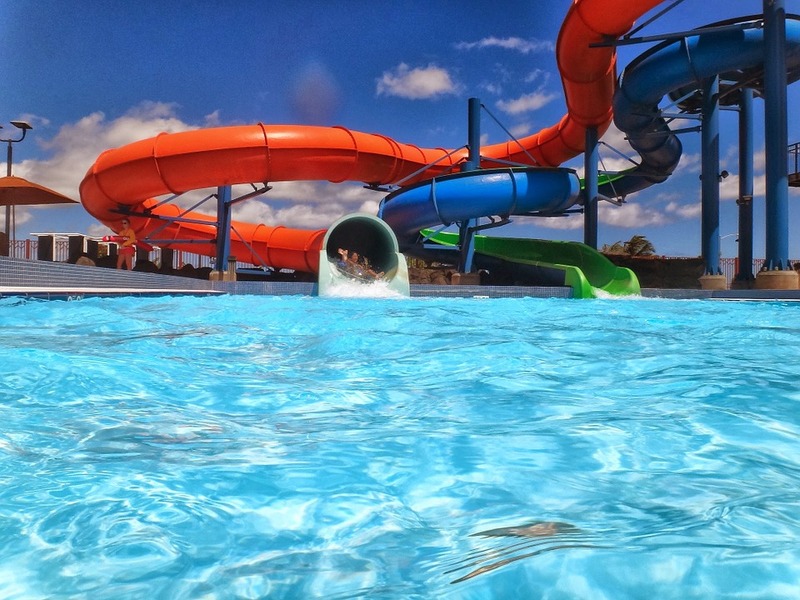 Now with six water parks in Texas including other North Texas locations in Roanoke, Mansfield, and The Colony, there is no excuse not to stop by on a hot summer’s day. They have wave pools, water slides, and even a Hawaiian Halfpipe! More information can be found on their website. 7. Explore Grapevine Mills shopping center. Grapevine Mills is more than a shopping mall; families can make a whole day out of the activities offered here. First, they can visit the LEGOLAND Discovery Center, where visitors can go on a Lego Factory tour or watch a 4D Lego Movie! Next,they can head across the aisle to Sea Life Grapevine Aquarium to check out the fish, stingrays, and other aquatic animals. Top it off with a lunch at the Rainforest Café, and you have a beautiful day indoors, out of the heat. 8. Ride some ‘coasters at Six Flags Over Texas. Located East of Fort Worth in Arlington, this 212-acre theme park is packed full of roller coasters, rides, and games the whole family will enjoy. They have live entertainment geared towards youngsters, and special events on holiday weekends. Their neighboring water park is perfect for days when it might be too hot during peak sunlight hours to roam the theme park. While it’s not the cheapest option, Six Flags is the perfect place to take your family on a splurge. 9. Go see a drive in movie. It’s a refreshing blast from the past to visit a drive-in movie theater, and there are several in the DFW area. CBS DFW does a great job of outlining some of the best. Families can go see summer blockbusters like Finding Dory, Teenage Mutant Ninja Turtles: Out of the Shadows, or The Angry Birds Movie in a way that’s a little more exciting than the normal movie theater. 10. Stargaze at a Planetarium. There are a few different planetariums in the Dallas/Fort Worth area including the Noble Planetarium (in Fort Worth), the UNT Sky Theater (in Denton), and the UTA Planetarium (in Arlington). Visitors can learn about the night sky while taking in breathtaking views of planets, stars, and maybe even a comet or two! Some planetariums have special events throughout the summer, so check out the one nearest you!